Infiniti M Hybrid driven | What Car? 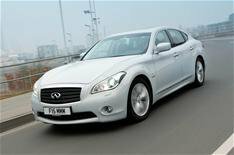 Infiniti's executive saloon gets hybrid power. The M35h has a 3.5-litre V6 petrol engine and a 50kW electric motor, which combine to give it 359bhp. This means the M35h is not only the quickest and most powerful M in the range, it's also the most economical, averaging 40.4mpg. So, on paper at least, it can now compete with impressive diesel execs such as the BMW 535d and the Mercedes-Benz E350 CDI. This is thanks to carbon dioxide emissions of 162g/km, which attract a 22% company car tax charge (compared with the 25% bracket the German diesel execs fall in to). At low speeds, the M35h is eerily quiet as it hums along on electric power, while the switch over to petrol power is seamless. However, unlike rivals such as the Lexus GS, electric-only power isn't just at low-speeds in the Infiniti the M35h can run on electric power at speeds of up to 60mph, improving fuel economy at cruising speeds. You can find yourself braking unnecessarily heavily as you get used to the regenerative brakes, but apart from that the car drives pretty much as the rest of the M range the steering lacks feel, the ride is still a bit jiggly at low speeds and it's not the most agile of cars. It's generally a refined car the standard double glazing tends to keep most noises out of the cabin so it's an ideal motorway cruiser. Like every M, the hybrid version comes loaded with kit, has comfortable, electrically adjustable seats and the only difference you'll spot compared with the conventionally-powered Ms is a slightly different dashboard set-up, with a dial showing when the car is running on electric power. One compromise in the hybrid is that it has a much smaller boot 350 litres compared with the petrol version's 500 litres to accommodate the lithium-ion battery pack. You can still squeeze in a set of golf clubs, but little else. The M35h will cost buyers just £1200 more than the diesel M, which is not a huge premium for a hybrid, so we reckon its the best M, thanks to its much lower running costs. Infiniti aims to offer car buyers something different to the Audis, BMWs and Mercedes of the world and with the hybrid Infiniti, it can finally do that. However, because the competition in the executive car class is so good, and the residual values of Infinitis struggle compared with its competitors, we'd still go with a BMW 5 Series or Jaguar XF.